Mouth Ulcers - FEELING DOWN AT THE MOUTH? 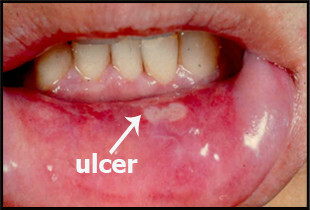 Mouth ulcers almost always occur on the inside of the cheek or on the gum near the cheek and sometimes underneath or on the edge of the tongue. These small sores usually form quickly and can be quite painful, however, there are now effective ways of treating mouth ulcers. Of course avoiding possible causes will also help. Damage on the inside of your mouth can result from very hot or acidic food, or hot drinks, and we’ve probably all experienced the consequences of accidently biting or chewing on the inside of our cheek. Over-rigorous brushing or using a hard toothbrush (better used for cleaning sports joggers or mag wheels) can cause mouth ulcers and the continual friction of loose or poorly fitting dentures can have the same effect. Anyone can get mouth ulcers, but they are more common in young adults and students, so it seems that stress may be a risk factor. Poor nutrition may play a part too. Low levels of iron, folic acid and B-group vitamins have been found to be common in people with mouth ulcers. Most mouth ulcers heal by themselves in a week or so, however, there are now products which can speed up the rate of healing and reduce the pain and inflammation. Antibacterial mouth washes are especially useful for mouth ulcers in those hard-to-get at places. They work best if you use them as soon as you feel a mouth ulcer coming on. They can also keep your mouth clean if it’s painful to brush your teeth. Dental pastes form a protective layer around and over the ulcer, and this type of paste containing an anti-inflammatory steroid is now available without prescription. Your pharmacist can advise you if this product is suitable for you. Mouth infections may sometimes be a cause of mouth ulcers, but long term use of certain antibiotics (and some other medicines too) has also been associated with mouth ulcer formation. Constantly dry mouth, another condition often caused by some medicines (including antihistamines, antidepressants and tranquillisers) will also increase the likely occurrence of mouth ulcers. If you suffer with dry mouth ask your pharmacist about the Biotene range of products.